Vertical farming is one of the new farming methods that became popular across the world where a large quantity of crops is grown in less space using vertical structures. A prototype design for vertical gardening/farming installed at Telangana State Horticulture Centre of Excellence in Hyderabad. 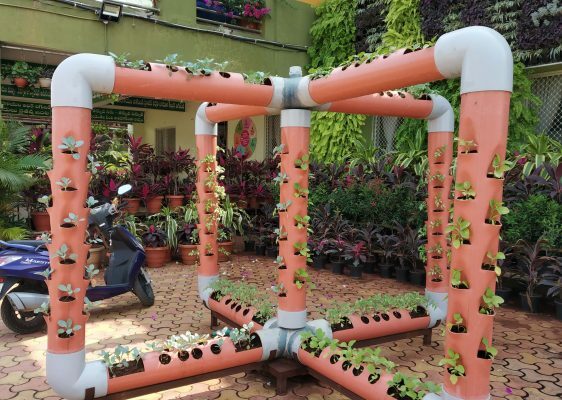 Hyderabad: The ubiquitous PVC pipes are all set to revolutionise vertical farming in Telangana State. 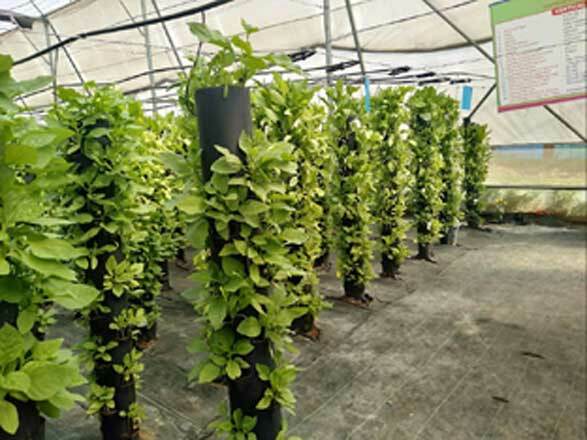 Telangana State Centre of Excellence for Horticulture (TSCOE) at Jeedimetla in Hyderabad developed an indigenous way of vertical farming using PVC pipes that are not only cheaper than many methods adopted by most developed nations but also requires less space and resources. Vertical farming is one of the new farming methods that became popular across the world where a large quantity of crops is grown in less space using vertical structures. Pots and tubs filled with soil are stacked into metal shelves upon each other for growing the crop. As this method is considered to be an expensive and high energy consuming method even for the Western countries, not many farmers in India are showing interest to adopt it. With an aim to minimise the infrastructure cost, the TSCOE developed the indigenised tower system of vertical farming using PVC pipes of 6-inch diameter under polyhouse. Under the new method, the PVC pipes are installed vertically in the ground and are filled with potting mixture (coco pit, vermicompost, soil, sand and other material). About 25-30 small cuts are made into the PVC pipes at regular intervals in order to plant the crop/seeds. A drip irrigation system is used for watering the plants. 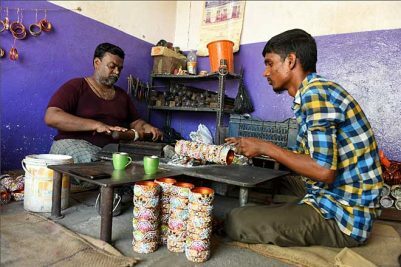 “We were able to set up the entire system for just Rs 9.41 lakh in an area of 560 square metres. Based on crop under cultivation and market prices, farmers can earn their investment within 24 months,” said TSCOE Additional Director of Horticulture Latha. The vertical farming method developed by TSCOE helped reduce water consumption by 90 per cent water and fertiliser usage by 70 per cent. Further, scientists were able to reduce expenditure by more than 50 per cent when compared to other vertical farming methods under usage. The new cultivation method which was started in October last year has already started yielding results within a month after its commencement. As part of the pilot project, TSCOE officials are cultivating leafy vegetables including Palak in about 600 square metres. Farmers can cultivate vegetables like tomato, capsicum, cucumber, lettuce, and broccoli as well, besides flower like orchids, gerbara, rose, carnation, lillium, and chrysanthemum, among others. They can earn anywhere between Rs 10 lakh and Rs 39.31 lakh per acre per annum using the vertical farming method in open ground and polyhouses respectively. The conclusions were drawn based on infrastructure expenditure and standard market prices. According to the Horticulture department officials, Telangana State is facing a shortage of 6.95 lakh tonnes of vegetables per annum in terms of cultivation and consumption. Hyderabad market alone is glaring at a gap of about 600 tonnes of vegetables per day. To fill the gap, the officials are planning to encourage urban farming and gardening using the new method of vertical farming using the PVC tower system. Individuals can opt for the tower system as part of gardening in their houses within an area as small as 100 square yards and install up to 200 PVC pipes.